Do you sometimes feel like you need space the size of a continent for your sewing needs? Our Aussie may not be the size of the Australian continent, but it is close! Our Aussie boasts an amazing 31.5 square feet of sewing space, when fully opened with quilt leaf and rolling caddy extended the Aussie is 99 1/2” wide by 80 1/2” deep. Don’t let these measurements scare you, when the quilt leaf is folded down and the rolling caddy is tucked under the Aussie measures 99 ½” wide x 22” deep. With so much surface area the Aussie is ideal for quilting or large sewing projects. 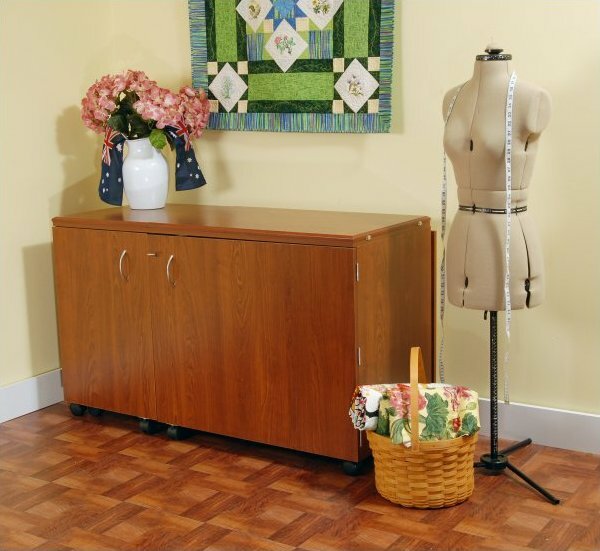 The large surface space also means you have plenty of room for multiple sewing machines or sergers. The rolling caddy can be placed in 2 separate locations on the cabinet and it tucks neatly away when not in use. The lift mechanism moves your sewing machine up and down in 3 separate positions and is adjustable for all heights of machines. The wide room in front of the lift allows the sewer to sit comfortably in the correct center needle sewing position. The quilt leaf extension on the back of the cabinet comes with your Aussie and helps to expand your work area preventing large quilts from falling on the floor behind the cabinet. Lastly your Aussie features numerous drawers and trays for storage of all your sewing notions and boomerangs. When your sewing is complete safely conceal and secure all your sewing notions and equipment by closing both doors and turning the key to lock them shut. The Aussie is offered in Teak and Ash White melamine to complement any décor. Adopt one of our Aussies today! Open Dimensions: 99-1/2" x 45-1/2" x 29"